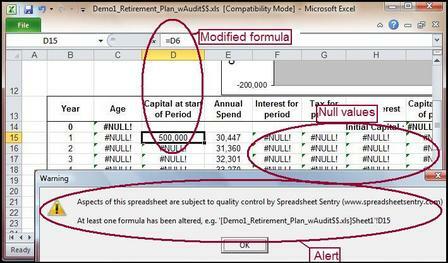 Are you confident that your spreadsheet is still operating correctly? And that no-one has tampered with it? Since inception, Spreadsheet Sentry has implemented signatures and checksums on each and every individual formula to ensure against corruption, modification, or tampering. Failure to satisfy the strict checksum regime means that the formula - or even perhaps the whole spreadsheet would not operate. While the above achieves a good level of confidence in the integrity of the spreadsheet, we recognized that one or more encrypted formulas could be deleted, or replaced with a normal, unencrypted formula. This meant that even an encoded spreadsheet operating without error was still not a guarantee of the spreadsheet integrity. Spreadsheet Sentry offers an optional innovative formula audit option in order to provide confidence that the calculation processes of an encoded spreadsheet have not subsequently been tampered with. This checks that every (encrypted) formula has not been modified or deleted.